Some protesters have accused India's Hindu nationalist BJP government of not doing enough to reassure the city's Christian minority. Thursday's protest came after a church in Delhi was vandalised on Monday, and an unexplained fire gutted another in December. Protesters carrying placards reading "Enough is Enough, What are police doing?" 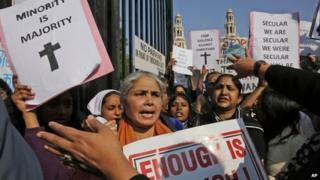 gathered outside the city's main Catholic Sacred Heart Cathedral in central New Delhi. "They have no permission to protest on the road. They can't just march to the home minister's residence. We have to protect the homes of VIPs,'' senior police officer MK Meena told NDTV news channel. Father Jolly, one of the protesters, told BBC Hindi that the attacks on churches was making Christians "feel very unsafe". "The prime minister is still silent on the issue. In the backdrop of these attacks, he should come forward and issue a statement. He should give us confidence." Police say that they have provided security to more than 200 churches in the capital. On Monday, unidentified people broke into a church in north Delhi and desecrated holy objects, reports said. In December, hundreds of Christians protested in the capital after a Catholic church was burnt badly in a fire. The police initially blamed the fire on faulty wiring saying it had been caused by a "short-circuit", but after protests by the Christian community, they registered a case against unnamed people.